Cream jugs : 0145. 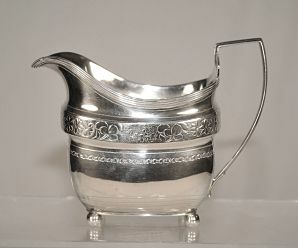 A George 111 antique silver cream jug. of shaped oval form, bright engraved with a floral and foliate frieze, a reeded rim and gilt interior, raised on four ball feet. The maker's mark is indistinct.